1. Please carry out Anderson‐ Darling normality test for the data provided in Table 1. What is the p‐value and inference at 5% significance level? 2. 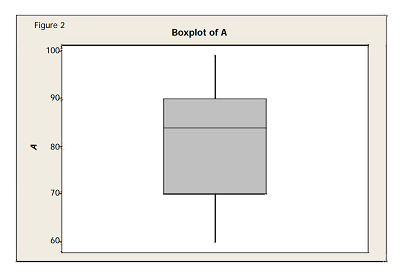 What % of points fall between 70 and 90 in the box plot shown in figure? 4. For the data provided in table 4, which of the following measures is a robust measure of central tendency? 5. Assuming the data follows perfect normal distribution, what % of the values fall +‐ 2 sigma of the mean? 7. What is sometimes called the 8th waste in Lean? 9. Which of the following is a discrete distribution? 12. According to John Kotter, what is the most common reason for project failure? 13. Which graphical plot plots quartiles?